Are you drawn to the amber color of aging book pages? Do you love the scrolling detail on an ornate ceiling medallion? Do you like roses? Yes, yes, and yes?! Well, this post has your name written all over it! I must say, I really enjoyed photographing this tutorial. The dimensions and shadows in the rose and medallion lend themselves so nicely to photography. Before we start, I need to give credit where credit is due. I saw a beautiful paper rose bouquet on 100 Layer Cake the other day, and knew I wanted to make one giant one. The bouquet was created by Valerie Lloyd for a wedding. So beautiful and unique! I had not taken down our Christmas decorations on the mantle (I know, slacker that I am.) But, this project propelled my desire to create a Valentine’s Day themed mantle. Step 2. 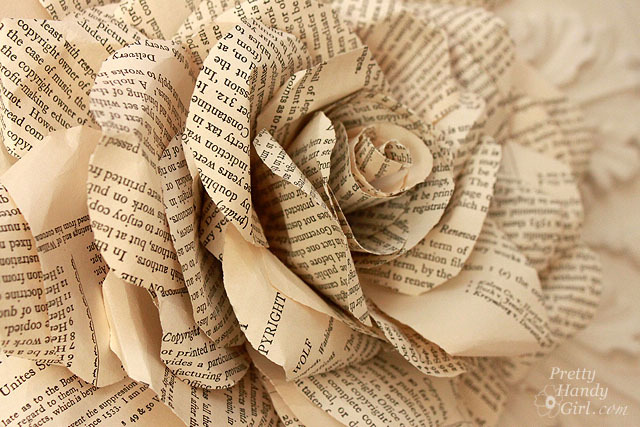 Cut out petal shapes from the book pages. Make some slightly larger and some smaller for the insides of the rose. Step 3. Curl the top edges of the petal back. Step 4. Fold the petal in half lengthwise. The curled edges will be on the outside of the fold. Step 5. Roll several of the smaller petals into a tube shape for the center of the rose. You should have a decent pile of petals collected before proceeding. Step 6. Cut a long piece of ribbon to feed through the center of the medallion. It is important to add the ribbon now before you build out your rose and cover the hole. Plug in your glue gun and let it warm up. Step 7. Cut a piece of cardboard large enough to cover the center of the medallion. Run a line of hot glue around the center hole on the back of the medallion. Place the cardboard over the hole. Step 8. Squeeze a large dollop of glue into the center of the cardboard (on the front side of the medallion.) Press one of the small petal tubes into the center of the glue. Hold it until the glue hardens and sets. Step 9. Continue working around the rose from the center out until you have a very full paper rose. Step 10. Let the hot glue cool. Fluff the rose and add any petals where you think your rose might need more. Tie a bow at the top of the ribbon and hang your beautiful wreath! 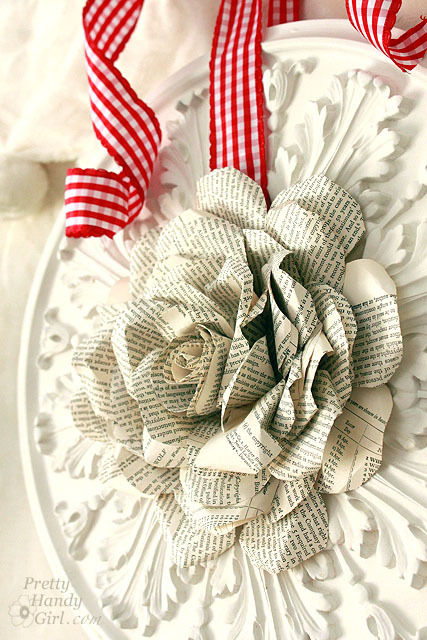 Stand back and admire your new romantic book page wreath. What did I tell you? This rose is so beautiful and fun to photograph. I’d love to hear from you if you make your own! Very rewarding and a relatively easy project. Is there a free pattern to copy for the petals? Sorry there isn’t. Just freehand your own. Flower petals are never perfect ;-).